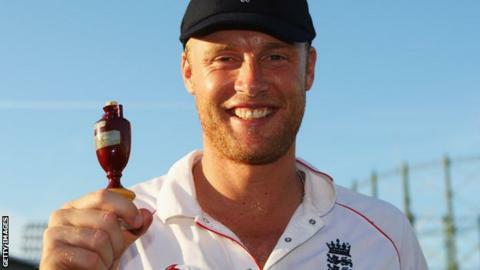 Former England captain Andrew Flintoff has been elected the new president of the Professional Cricketers' Association. The all-rounder succeeds fellow Lancastrian David Lloyd to become only the seventh president in its history. Flintoff, 38, said: "This is a huge honour, especially as it will be the Golden Jubilee of the PCA in 2017." He played in 79 Tests, 141 one-day internationals and seven Twenty20 internationals between 1998 and 2009. Flintoff, who played a key part in two Ashes series wins in 2005 and 2009, was also voted BBC Sports Personality of the Year in 2005. Only John Arlott, Jack Bannister, Mike Gatting, Sir Ian Botham, Chris Broad and Lloyd have previously been president at the PCA, the representative body of past and present first-class cricketers in England and Wales.